Since its beginning in New York City in 1837, Tiffany and Company has been one of the leading designer jewelers in the United States, long before names like Angara and Blue Nile existed. And still tops the list of top designers, continually topping quarterly estimates for revenue. Fine jewelry is moving increasingly to e-commerce, and every company, including a company as old as Tiffany and Company, has been forced to adjust. By 2020, the international jewelry industry is expected to exceed 250 billion euros, or about $286 billion American dollars. While just a small portion of fine jewelry sales are attributed to e-commerce based companies like Angara and Blue Nile, there’s plenty of signs that’s increasingly changing. A 2017 survey by Statista revealed that nearly 30 percent of consumers preferred to shop for jewelry online. While Tiffany is still a respected jewelers, it’s increasingly had to offer products online, and been forced to compete with companies like Angara and Blue Nile, which sell not only fine jewelry, but customer friendly services at the click of a mouse. Angara and Blue Nile are both successful ecommerce companies and for good reason. Both Angara and Blue Nile offer customer friendly services, a wide selection of high quality gems and diamonds, and countless options for every taste and budget. While we will be focusing our review on both customer policies and speciality diamonds, engagement and wedding rings, we will also take a quick look at other products, such as fine jewelry ands anniversary gifts. When it comes to comparing Angara vs Blue Nile, it’s important to consider what you’re looking for in a fine jewelry company. The good news is that both have been in business, with a solid history of sales and customer satisfaction, for long enough to be reasonable choices. Here’s what Angara and Blue Nile offer, and how they compare. Angara’s company name comes from the Greek word sanskrit, which translates as “the fire within”, perhaps to evoke the company’s emphasis on precious gemstones like sapphires, rubies, emeralds, tanzanite, as well as a healthy collection of diamonds. What started as a family business grew, in 2005, into an e-commerce jewelry with a collection of over 7,000 products. Their jewelry is made mostly in Los Angeles, but also in Thailand and India, with their flagship headquarters situated in the Los Angeles Jewelry district. The main benefits Angara touts includes price matching, GIA trained appraisal services, and generous refund policies. Ratings and Reviews: Angara has been accredited since 2009 and holds an A+ rating with the Better Business Bureau, with an average 5 star rating from a total of 54 customer reviews. On Bizrate surveys, an aggregate consumer review site, Angara hold a 9.1 out of 10, with customers exceptionally pleased with return policies, product availability, and clarity of product information. There are nine listed complaints on BBB for Angara. The few complaints focus on product or order confusion, as well as rings not wearing as well as expected. It is unclear whether or not these complaints are reputable. Returns: Angara offers a 100% refund on products if exchanged within 30 days. This is only offered for products that have not been worn and are in the same condition as when they were received. Free return shipping is offered for all domestic orders if you fill out an online form. International returns, however, require the consumer to pay shipping and any shipping insurance fees. It also should be noted that there is not a clear guideline as to what returns can be made for, though Angara states it’s “if you’re not 100 percent satisfied”. There is a slight discrepancy here, as Angara also lists a 75 day return policy. It is unclear how this aligns, or conflicts with their standard 30 day policy. Gemstone and/or diamond tightening (also covered under free lifetime warranty services). Re-polishing and cleaning of jewelry (recommended once every year; also covered under free lifetime warranty services). As you can see, the plan is fairly inclusive in terms of normal damages it’ll cover. Shipping is free for domestic on all services, but at a cost for international shipping. How much does it cost? Well, that is a bit less transparent. Angora redirects you to the “add-ons” section on their products main page. How much a plan costs varies based on the value of your purchase. On a $2,000 ring, the warranty costs about $400, to give you an idea. You can find how much the plan costs for any product by selecting the product and scrolling down to see a little box that offers an add-on warranty plan. Do note this is NOT a lifetime warranty: plans last for only 5 years. However, they do offer a lifetime warranty that provides basic maintenance. Security and Payment: Angara uses SSL (Secure Socket Layers) to process credit card payments. You can also pay with Google Checkout, Paypal, or even by phone. They use Verisign to authenticate the purchase. Both Versign and SSL are standards for secure electronic payments and communication. Another plus is their payment options: you can pay for a ring outright, or opt for two or three smaller payments. You do have some options with how your information is shared, including setting your browser to a “do not track setting”; opting out of Google Analytics (a service they use); and unsubscribing from email lists. Engagement rings range from $89 to $43,000 and include countless options for both diamond and gem centered rings. Sort by price, arrival date, and bestsellers. Easy to use filters include price, gemstone/ diamond type, shape, style, carat weight, and metal type. All their gemstones and diamonds are certified conflict free and come with a free lifetime warranty (you pay extra for extended). When select a style, you can change the metal type, gemstone cut type, and add on an extended warranty and jeweler’s appraisal services for additional fees. Engagement ring stones include: sapphires, rubies, emeralds, tanzanite, aquamarine, amethyst, pearls, morganite, garnet, opals, blue topaz, peridot, pink tourmaline, black onyx, citrine, and moissanite. You can also search for diamonds, and colored diamonds, like blue, black and even coffee diamonds. This is a highly impressive selection for anyone looking for more color than the traditional engagement ring. Styles include classic, side stones, solitaire, three stone, vintage, inspired, two stone, stackables, heart, knot, and infinity, among others. Rings come in different K counts of yellow and white gold; silver; platinum; rose gold, and even two toned gold. While there are some modern rings, many have a vintage feel to them, or even art nouveau. Opal cathedral rings with a diamond halo, freshwater cultured pearls with a diamond bypass, and a vintage emerald ring with ornate shank are some of the finest examples of their mid range rings. While there are a few more classic looks, especially if you’re looking into more traditional diamond rings, the star of the show is definitely their gemstones. Gorgeous, offbeat, and still classic, these engagement rings simply stand out from engagement rings offered by other large online jewelry companies. Each ring is viewable by stock photo, animated video, on a digital finger, and with three different perspectives. Are there downsides? Yes. There isn’t that much room for customization, aside from switching different metal types. And without much in the way of guides or other advanced filters, it can be a bit overwhelming if you don’t know what you’re looking for. Wedding bands include many of the same filters and features as Angara’s engagement ring collection. The difference is that these are in nicely organized collections, making it a little easier to find what you’re looking for. Select from men’s and women’s plain, diamond, and gemstone rings. Prices for women’s wedding rings range from $119 to $6,719. Here you’ll find some more simple classic bands, as well as bridal sets with ornate filigree, ‘nature inspired’ bands, and coffee hexagonal bands, among many others. Select from classic, solitaire, infinity, vintage, stackables, and plain bands. While engagement rings mostly seem to be the emphasis for Angara, the company also offers some beautiful and unique options in other fine jewelry, including bracelets, birthstone gifts, earrings and necklaces. All come in a variety of diamond and gemstone options. Overall: As a whole, Angara offers some exceptional service and stunningly unique wedding and engagement rings, at a wide range of prices. Colored diamonds, but especially a stunning array of gemstones are the highlight here. We’d like to see more transparency as to where their gems and diamonds are sourced, some more options for customization, and a little more emphasis on their diamonds. As one of the leading name in the online jewelry industry, Blue Nile has a very large inventory, compared to Angara: at any given time, there is over 150,000 diamonds alone in stock. Based in Seattle, Blue Nile has actually been in operation since 1999 and, unlike Angara, it is not solely an online company: there are physical showrooms where customers can see sample products across the country, in Oregon, New Hampshire, Virginia, New York, and Vermont. Touting itself as the seller of the world’s best diamonds, it’s clear right away that there are some very big differences between Blue Nile and Angara, which instead emphasizes its dazzling collection of gemstones. Like Angara, Blue Nile holds BBB accreditation with an A plus rating. Customer reviews, however, are lower, and include more complaints. While Blue Nile is a larger company which often lends itself to more complains, the average rating is still notably lower than Angara. As just shy of 3 out of 5 stars, many customers were thrilled with their purchases, while others complained largely about service, from slow responses to less transparent return processes. Strangely, on BIzRate Surveys, Blue Nile just barely edged Angara out, with a 9.3 out of 10 average rating, with many satisfied with the overall product Blue Nile delivered. Like Angara, Blue Nile offers a plethora of incentives to make purchasing more appealing. Returns are also available if made within 30 days, with free and secure shipping for all domestic purchases, which is more or less what Angara offers. You can even track your shipping directly through Blue Nile’s website. Returns require that the product is in its original state, though engraved items, other than rings, are not eligible for return. If you’re outside the return period, Blue Nile goes a step further than Angara and offers a Diamond BuyBack option, where you can sell diamond jewelry or loose diamonds “based on current market value”. Diamonds must be .3 carat or larger to qualify. Like Angara, shipping is free, with sales tax applied to only a few states. You can opt for other shipping options, however, like optional Saturday or alternative address shipping for more convenience. All products arrive in a jewelry pouch or box. Blue Nile does not offer an advanced warranty plan like Angara, but does offer a similar lifetime warranty on its products, which covers cleaning, inspection, and general maintenance. Blue Niles does also offer option appraisal services, as well as a link to outside jewelry insurance. Blue Nile also uses SSL to secure payments. Acceptable methods of payment include Paypal, major credit cards, and Bankwire. Purchases made via Bankwire that are $750 or more are eligible for a discount. While the flexibility and secure payment methods are a plus, Angara’s financing systems seems a bit simpler and less likely to land you with unexpected fees. If gemstones are the star of Angara’s engagement ring collection, diamonds reign supreme for Blue Nile. Instead of rather basic option offered at Angara, Blue Nile prides itself on the many options, customization, and transparent sourcing of their diamonds. All Blue Nile diamonds are GIA certified. Diamonds are sourced from Canada; Blue Nile’s stock is mostly from Australia, Russia, Africa, and Canada and adhere to the Kimberley Process. Diamonds also adhere to what Blue Niles calls the “principles of environmental stewardship”. While Angara states that their gemstones and diamonds are ‘ethically sourced’, Blue Nile is a bit more clear about their standards. Angara does not offer much in the way of designer rings, so if that’s what you’re after, Blue Nile is the better bet. It’s also easier to sort by special collections, and offers the same sort of filters and sorting tools Angara does. Another big difference: customization. While Angara’s rings are arguably more unique in style, Blue Nile allows you to build diamond engagement rings from scratch, and offers photos in the process, as well as 3D views. You can even preview your selection at a showroom. With diamonds of every cut you can imagine, customization, many precious metals, and even engraving, Blue Nile gets an edge for diamond engagement rings. 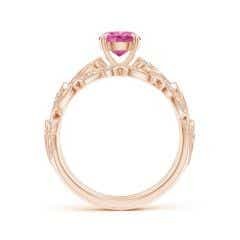 It is, however much slimmer in terms of gemstone and vintage inspired rings. Prices start at about $130 and go up to a staggering $35,000. Select from diamond, eternity, and different metal bands. Bands are mostly classic or modern in style, and very diamond centered. Pave, scalloped, and twist styles range from elegant to simple, and manage to be both timeless and modern at the same time. It’s a huge selection, but more or less what you’re used to seeing. Like Angara, Blue Nile offers jewelry, earrings, necklaces, bracelets, and gemstone gifts. You can also shop designer collections and even make your own custom diamond jewelry. Again, the focus is on both diamonds and customization. You can craft your own jewelry but it’s more limited than what Blue Nile offers. Deciding between Angara and Blue Nile depends on what you’re primarily looking for. Both are accredited, and have been, for quite some time, and both offer customer friendly services, like free domestic shipping with insurance, free general lifetime warranties, and easy to easy search filters. Here’s our verdict.